I don't think I need to tell you guys again how awesome School 207 is and how you're missing out if you're not watching it, do I? Lol. Good, I'm glad we didn't need to have this talk. Below are all the memes from week 6 of this lovely drama and you can find all my other School 2017 posts here. Oh my gosh you guys, Strongest Deliveryman is my kind of drama. It keeps getting better and better. It's hitting every single one of my emotions. It's the very definition of an emotional roller coaster and it's so enjoyable. Things are messy, things are frustrating, but it's hilarious and it's rewarding and the characters have so much depth/potential. Ugh, anyway enough ramblings. I suggest you check it out - then again it's not for everyone but maybe give it a try if you're on the edge. Anyway, lots of memes this week because I had lots of feels. You can find all my Strongest Deliveryman posts here. So much chemistry between the leads in the drama and it just keeps building. When I think there couldn't be more chemistry - suddenly there is. I'm surprised how sometimes the chemistry between the leads in high school dramas is more intense than in other dramas. I think it's because they can't rely heavily on skinship in a high school drama (because it's not super appropriate) so they have to build the emotional chemistry instead. The result to me is much more compelling. I hate nothing more than when a show gets lazy and relies on skinship alone to build the relationship when the leads have no chemistry otherwise. In general, that's one of the reasons I prefer Kdramas is because they're better at building relationships than Western Dramas where the characters jump right into bed with each other. I feel like Kdramas have had more skinship lately, which would be great if the chemistry didn't suffer, but honestly in a few cases it has. Anyway, sorry for the rant but that's one of the reasons why I'm so into School 2017, because it recalls those intense feels that dramas have always given me in the past - only the School 2017 couple has some of the strongest chemistry I've seen in a long time. You can find all my School 2017 posts here and in the meantime, here are my memes from week 5. I've been thinking lately about how I should be doing more of these first feel blogs - ideally for every drama I watch. Because I know 4 episodes in is a good place to stop and let others know kind of a vibe the drama is giving off so far so they can decide if it's something they're interested in watching. It's close enough to the beginning so that you can catch up if you'd like and far enough along that we have a pretty good idea of where the plot is going. So here we are 4 episodes into Strongest Deliveryman and I'm ready to share my first feels with you. I chose Strongest Deliveryman for a couple reasons. The first was that we were in/kinda still are in a Kdrama drought and it seemed like the shiniest oasis. The second reason was who doesn't love Go Kyung Pyo? My interest in him was sparked in Flower Boy Next Door years ago and I've loved seeing him in everything he has done since then. I was excited when I realized Chae Soo Bin was the second female lead. She played the frenemy/villain we all loved to hate in Cheer Up!, one of my favorite dramas of all time. And I firmly believe it takes a sensational actor to play a character that people hate that much. After watching the first four episodes I feel like I should...Keep my expectations high and hold on for a wild ride. Quick Summary: Kang Soo is the world's kindest deliveryman. He's on some sort of mission, the likes of which we aren't privy to yet, but it takes him to every neighborhood in Seoul for 3 months moving from restaurant to restaurant. Along this mission he seems to have made good friends in every neighborhood. His newest location brings him to the same noodle shop as Dan Ah, a delivery woman who rivals if not beats him in skill. She's working hard to save up every cent she can to leave the country to start life afresh. Introduce Oh Jin Gyu, a spoiled heir, who races his friends in their sports car for sport and Lee Ji Yoon, the daughter of a wealthy family who wants to runs away from home at age 23 so she can try to make it on her own without relying on her parents. Dan Ah ends up saving Jin Gyu's life and Kang Soo ends up saving Ji Yoon in a way too. Both heirs indebted to their saviors, they look for every excuse to hang around the noodle and thanks to a fun twist of parental intervention Ji Yoon and Jin Gyu find themselves wrapped up in each others' lives more than they ever wanted to. The potential for friendship, romance, and unfortunately potential to be lifelong enemies hangs in the balance with our four leads. The best characters. This drama has so much potential for character development it is insane. Take Jin Gyu, for instance, a character that on the surface level seems very shallow and single-minded - well, when his backstory is revealed suddenly you see him in a whole different light. You understand and sympathize with his flaws and can envision a future for him where has become his best version of himself. And Dan Ah who has always gotten the raw deal out of life and while she has tried to become jaded to it all, kindness still spills out when she's not being vigilant. 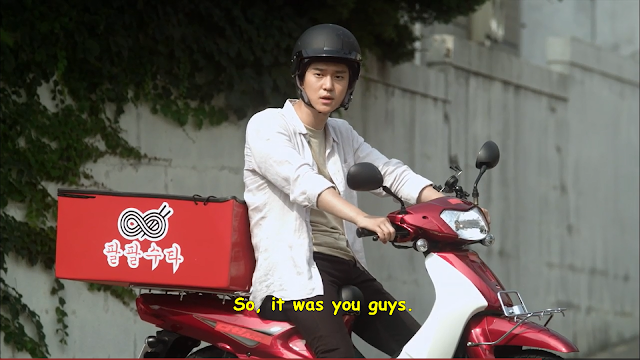 Kang Soo's past is mysterious but we do know that he's taken care of people and treated them so well that hundreds of deliverymen materialize from all over Seoul when he asks for help with a problem. Ji Yoon makes a second female lead that I actually enjoyed. Her bright personality and strong work ethic are a welcome change from the spoiled heiress. She's willing to put up with less than ideal living arrangements if it means becoming her own woman. We've only just begun and can only see the beginning of these characters' tangled stories, but we can already tell that it's complicated. Without giving too much away, this drama really helps you to see things through an empathetic lens. A major conflict comes and disrupts our leads and divides them into two clear sides. You realize there isn't a simple answer as to who is right and who is wrong. It's so much more complicated than that and all you really want is for them to be able to see eye to eye, but even that isn't really possible. So far, this is a character-driven drama that has the strong characters and the talented actors to pull it off. I am looking so forward to next week and seeing where this drama takes us. Something tells me that this is going to be one to remember. Stop now, if you haven't seen and don't want any spoilers. Below I'll give some additional thoughts on what has happened so far for those who have seen or are curious. -I don't think it'll happen, only because in my experience at least 93% of Kdrama leads end up together. However, the way things have progressed through the first 4 episodes, there are more interactions with the leads and the second leads and it feels like one of those dramas where the second leads could win. -I won't go too much into this because I genuinely feel for Jin Gyu, but I don't think Kang Soo is in the wrong at all. Jin Gyu committed a crime. A crime that lead to his friend not getting the medical attention he needed in time. While Jin Gyu did seem genuinely sorry, he clearly doesn't know how to show his sincerity. Offering to pay made it seem like he was trying to cover up a wrong rather than take ownership. From the evidence that Kang Soo saw, taking him to the police station was the right choice. I think Jin Gyu should have tried harder to express his sincerity rather than turning arrogant right after the police station. You can't make a new start and become a better person without fully acknowledging the things from your past that you need to change. -I don't have an OTP, because I equally like all possible pairings. I just would like all of them to be happy. Although, I really love the antics that arranged dating of Ji Yoon and Jin Gyu has brought to the table. Both of them trying to repel the other while not being the one to break the relationship themselves is hilarious. I'm a little scared that since they haven't really shown any chemistry between Dan Ah and Kang Soo yet, that when they do it's going to be so intense that I won't be able to handle it. Lol. -I'm really really bummed about the bromance between Jin Gyu and Kang Soo has gone south. They had the potential to be one of the greatest bromances of all time. They clearly both have good hearts and I don't think I've ever seen two characters get over an initial misunderstanding as quickly as they did and move onto genuine bonding. So sad. Hopefully it can be revived. I could go on and on about this drama - and I have over at DramaFever's Drama Club. To check out our Drama Club posts and all the memes I've created from these first 4 episodes check out all my Strongest Deliveryman posts here.